A woman’s ivory earrings (in the shape of halibut) are connected by a necklace of glass beads that hang below the chin. Virginia Minock: Tangerlallruunga miklua. Cakneq tangsugnarqut. Joan Hamilton: They were kept on it for a very long time. You can tell by dirt. John Phillip, Sr.: Naternaraumeng-am taum pilillrullinia una. John Phillip, Sr.: Ukatmun aturyarauluni wii tangllemni wani-wa. Ukuk wani elaqliulutek. Neva Rivers: Iqataneng makut apraqait. Iqataq makut nuveviit. Joan Hamilton: Kiirrmeng-q’ arnat makucinek aturlallruut? Wallu-q’ angutet aturyumaluki? John Phillip, Sr.: Angutnek tangeqsaitua makucinek arnanek taugaam. 1. This entry includes discussion of similar item E3340332. 2. 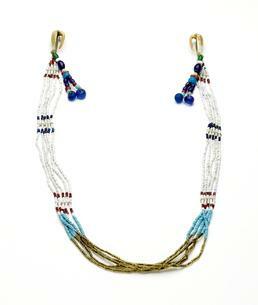 Iqatat—plural of iqataq—”separators” are “pieces strung between beads on necklaces” (Fienup-Riordan 2005). Yup’ik Elder Annie Blue of Togiak gave the name agluirutet for earrings that are connected with strands of beads. (1) This set was collected on Nunivak Island in 1927.